Spring is here! Our morning time is an important part of our family rhythm that ebbs and flows with the seasons. 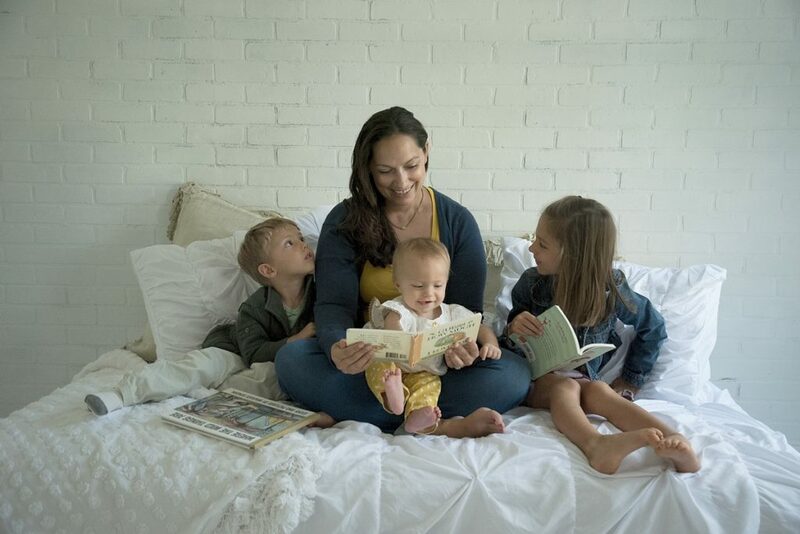 The basics of our morning time remain the same all year, but our song selections, verses, and read alouds usually reflect the current season or my children’s current interests. At this time, my children are 6 years old and in first grade or form 1b, 3 years old, and 16 months old. We try to take our morning time outside whenever possible to take advantage of the wonderful fresh air while we are learning. While we are a mostly Charlotte Mason-inspired family, our morning time draws on some elements from the Waldorf philosophy as well. In my mind, there is a lot of overlap between Charlotte Mason and Waldorf in the early years. Both philosophies value teaching the whole child with an emphasis on the natural world. We start every morning time with our good morning song, Good Morning Dear Earth. We all shake hands at the end of the verse as a way to practice a firm handshake- the kids love this! Next we do yoga or some kind of movement. Probably half of the time, we do a sun salutation along to Kira Wiley’s Dance for the Sun. This is our favorite yoga resource ever! The CD has lots of great music and instructional yoga stories to learn different poses. If you have Amazon Prime, you have access to tons of free music including this awesome album. If you don’t have Prime, what are you waiting for?! As a side note, we listen to all of our music during our morning time on an Amazon Echo. I am not a fan of technology, but I seriously love this thing! I load up all the music on our morning time playlist so it’s ready to go when we need it. We’re also using these Yoga Pretzels cards to learn some new poses and practice some partner poses. It also has some fun games like the Simon Says knock-off “Yogi Says” that my kids love. We shuffle the cards and pick one to do a few times a week. We start our read aloud with a moral lesson- a reading from the Jesus Storybook Bible, a Psalm, a proverb, or a fable from The Aesop For Children. Then we usually read one or two picture books, or I tell a seasonal story. Most of our stories begin with ideas from Tell Me a Story, but I usually end up adding to them. If you are new to storytelling, I highly recommend this book! It has a great selection of sweet stories for preschoolers based on seasons and festival celebrations. After our picture books, we do our memory work. I always have a few options for my daughter, but she often finds a verse on her own. We read one each day for a week, and by the end of the week she usually has it memorized. For longer pieces, we take two weeks. and flowers cover the face of the Earth. We are enjoying following along with Happy Hymnody to learn a new hymn each month. We don’t go to church, but I love the quality and beauty of old hymns. The lyrics and music from today just isn’t like it used to be! We sing our new hymn each day and by the end of the month we all know it well. At this point, my 3 year old is usually ready to move on to other things. My 6 year old and I continue with a poem from Mother Goose or our current poet, Emily Dickinson. Each term we select one poet to read from and learn about. We’ll often use this time to read from the poet’s biography as well. Sometimes I will tell a fairy tale story aloud instead of reading, often to tie into our Jot it Down fairytale project. Depending on time and mood, we sometimes add in an extra subject here. It might be a picture study portfolio or nature study from Exploring Nature With Children. Sometimes we throw in a little Spanish lesson or do composer study or do a history lesson. I rotate through the subjects that we only do 1-2 times a week and fit them into this space. We usually end by signing old favorite songs. I let each kid pick one oldie but goodie to sing- sometimes it’s a folksong, sometimes a hymn, or sometimes on we’ve made up! Then we end by getting up and moving our bodies for a brain break before we start lessons. We might play a circle game similar to hot potato or do another yoga pose or just pick up a ball and start tossing it. We also love songs with sign language. We used to have a closing verse, but we never seem to get to it these days. Our morning time is fun and wonderful and so special to our family. We don’t do morning time every day because we have a couple of morning commitment. But when we do it, it’s the highlight of our day. It’s not a time for stress or worries over perfection. I make a plan, but we often change things up and let our morning time evolve into what it’s meant to be. This post is full of great ideas! 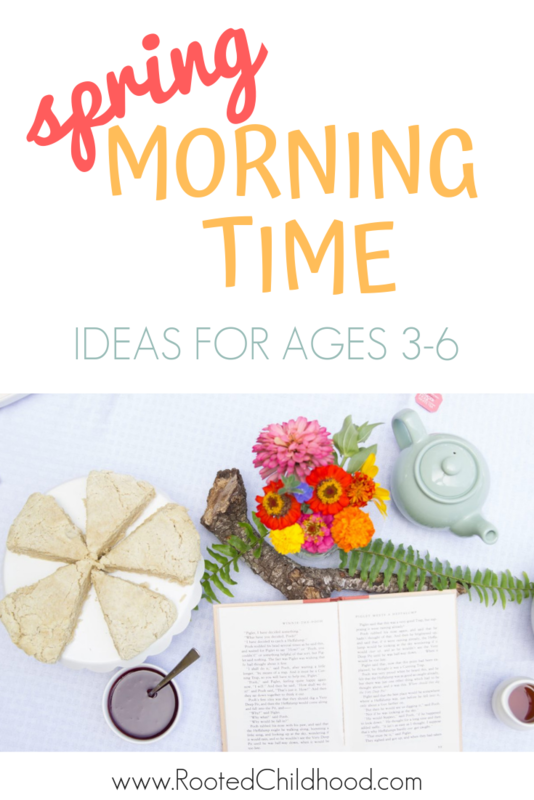 I love that I can get inspiration as I plan our morning time without having to visit numerous blogs. I also love that you have a wide selection of books, songs, and stories in your Rooted Childhood Collection. I would love to see more posts about your morning time in different seasons and in general what your day looks like. I can use all the help I can get in that department. I struggle with trying to find a good rhythm for our family and to stick with it. Thanks so much for the kind words Sheilina! I share lots of behind the scenes peeks into our day over on Instagram! I love this morning routine, especially your morning song! Thank you for sharing. Thanks so much, Ashley! That song is one of our favorites!